In the last two posts (Part 1, Part 2), we created a simple plugin and explored some of the files that ProcDOT stores data in. 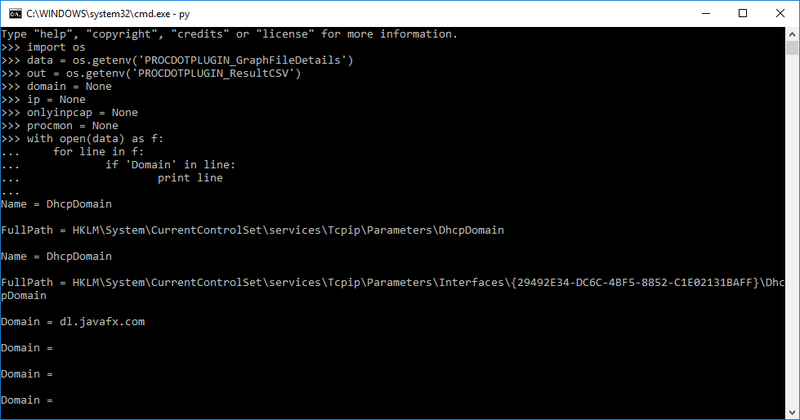 We will now leverage both of these to create a plugin that lists the servers in the graph. This is not a tutorial on python but, I will try to explain some of the plugin to show where the information is coming from. Yes, I know, Christian has already made this plugin. But, by looking at this plugin, it helped me to figure some of this stuff out when I first started out writing plugins. If you remember from part 1, there was a reason I liked to use python. By rewriting this plugin in python, I only have to maintain one plugin (the serverslist plugin has a batch script for Windows and a bash script for Linux). 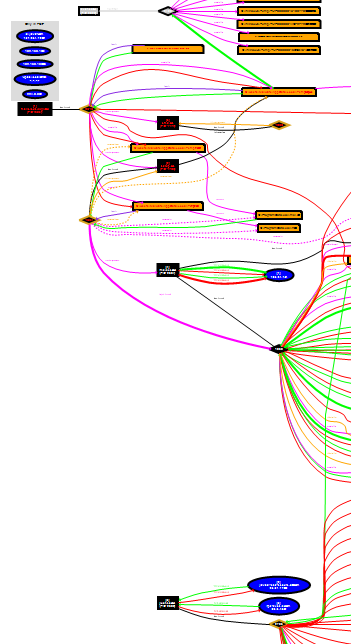 We'll start out by firing up ProcDOT and generate our graph.Looking at the graph, I have eight different server nodes (yours might be different). Make note of the servers listed. 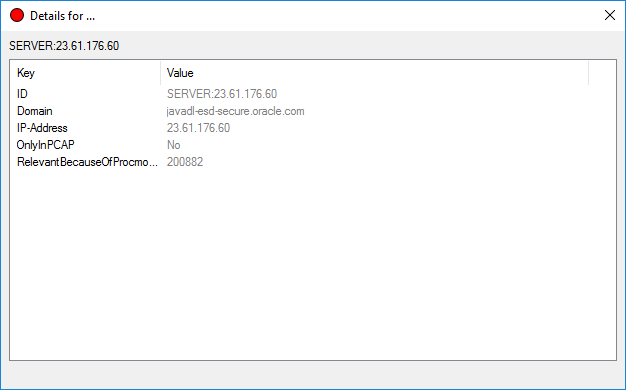 Right click on one of the server nodes and select details. Looking at the details for a server node, we can see there are five different keys and values. With this information, we can start to build our plugin.Go to the Plugin menu and launch the cmd plugin. So, we now know the information we are after is in the details file. 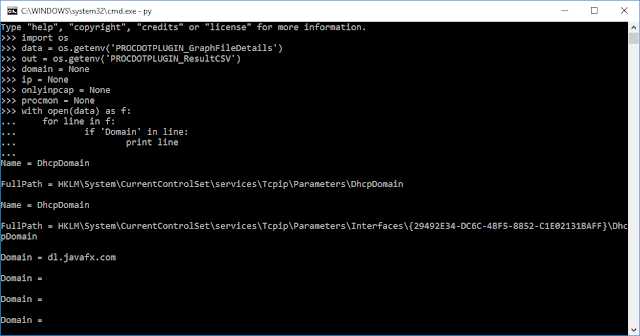 If we type set | find /i "procdot" in the cmd prompt, we can see the variable that we will have to call is PROCDOTPLUGIN_GraphFileDetails. If we want to display output, we will also have to call PROCDOTPLUGIN_ResultCSV or PROCDOTPLUGIN_ResultXML because we are going to create a table. We will create our plugin output with PROCDOTPLUGIN_ResultCSV for this example. From here, drop into a python shell by typing python and hit enter. We will need to import os into the python shell so we can get our ProcDOT variables and assign them in our plugin.After that, we will create some variables for our key data we are after. 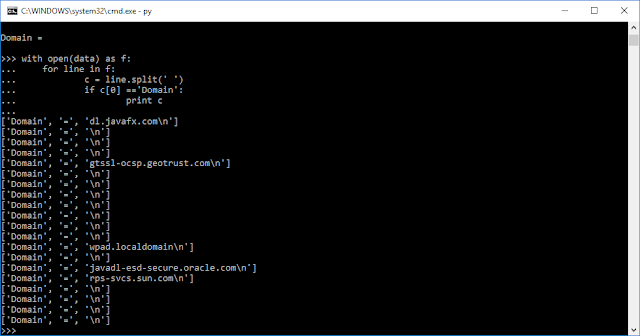 Next we will open the details file in python and search it, line by line, for the Domain keys. 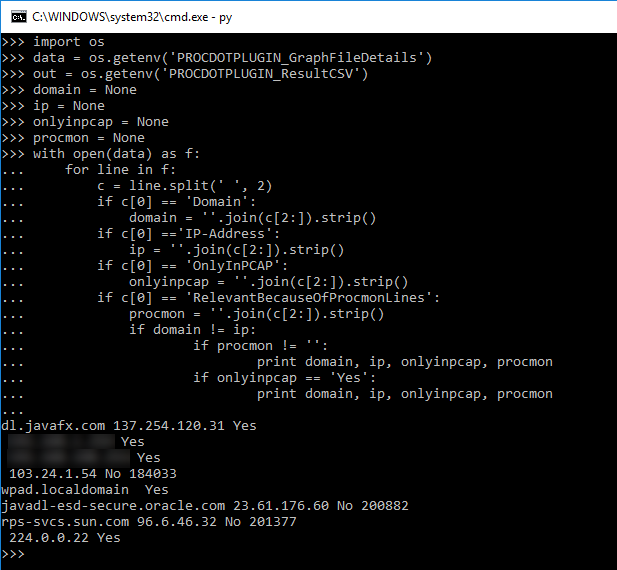 For every hit we get on Domain, we'll have python print it out. Hmmm. Looks like we are getting back the Domain key and then some. Looking at the format of the file, we can split the lines apart with a space. This will split the line into three parts. We can go back and search the first part for Domain and try it again. Now we are getting somewhere! But there is another problem. 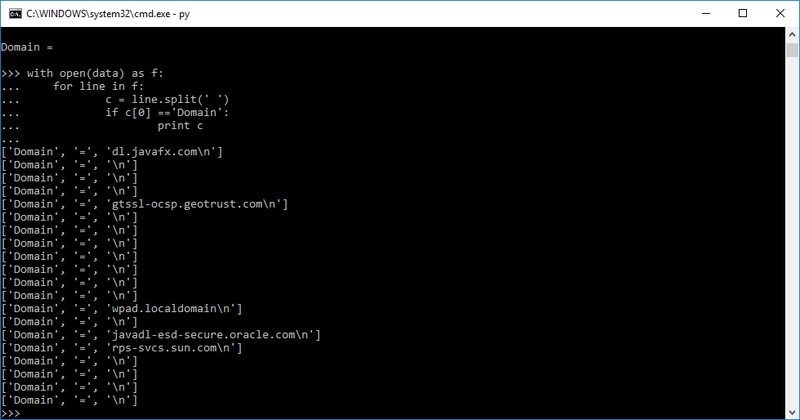 Not every server node has a Domain tied to it. 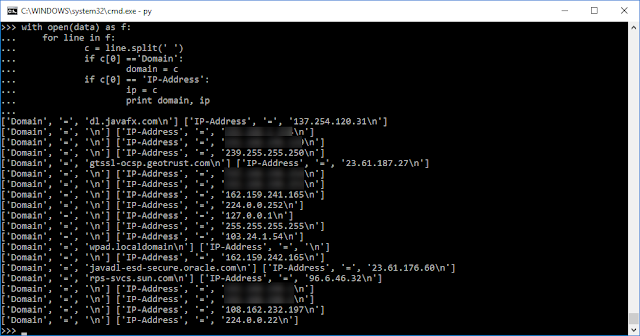 If we look back, we can see that we can also search for the IP-Address. I we assign these to our variables, we can print these together. Looks good. 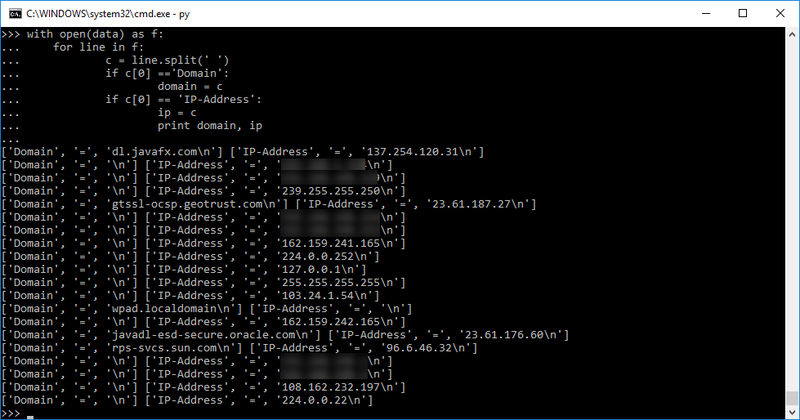 We can now identify a server node by either its Domain or IP-Address. Wait a minute though. My graph had only eight server nodes in it. Lets list out the rest of our keys and see if we can narrow this list down. So, looking at the output, we can see that the server nodes that are in the graph also contain an entry in the RelevantBecauseOfProcmonLines key. 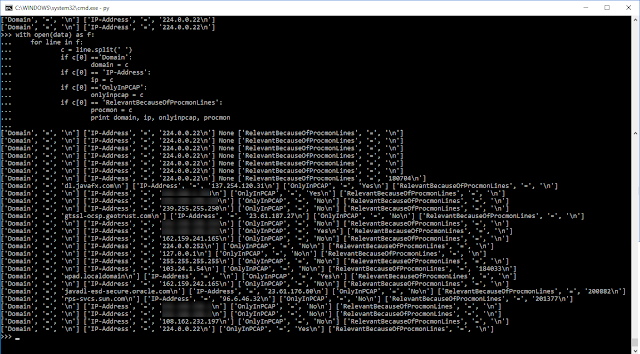 And the server nodes that are marked yes in the OnlyInPCAP key are also in the graph. Lets parse this out a little more and strip out what we don't before we write our actual plugin. We'll reset some of our variables and finish this up. Nice! We can now write our plugin. In order for our output to come out right, we will have to refer to the ProcDOT documentation to make sure the result csv is properly formatted. So looking at this, the first line of the file contains the headers surrounded in quotation marks and separated by commas. The next line is the column widths, then finally our data. We are only going to have headers for the Domain and the IP-Address. We'll add some style by marking the server nodes that are only in the pcap with blue lettering. With our plan in place, we can create the plugin and the pdp file. Save these to your plugin folder restart ProcDOT and generate a graph. From the Plugin menu, select server and you should see the results. Success! We made a plugin to display all the servers in the graph. Before we conclude, the cmd plugin can be used to troubleshoot our plugin. Lets say we made a typo in our plugin and no results were returned. We can't see any of the error messages to see what happened. To test this out, open the server.bat file and change domain = None to dmain = None and save the file. If we run the server plugin again our results come back empty. We don't know why because we cannot see the errors. Close out the results and launch the cmd plugin from the Plugin menu. From this command prompt, we can run the server plugin manually. Type server.bat in the command prompt and hit enter. From the output, we can see the error UnboundLocalError: local variable 'domain' referenced before assignment. If we edit server.bat back to domain = None and save again, we can run the plugin manually and see that there are no more errors. Pretty neat! Our simple cmd plugin turns out to be rather useful for writing and troubleshooting plugins. Now that we have a way to better develop our plugins, we will create a plugin for the context menu in the next tutorial.